CPAC 2013 Tea Party Patriots LIVE! Former Rep. Allen West, (R-Fla.), discusses whether the Kentucky Senator is the future of the Republican Party. CPAC invited West to give the keynote speech at the conference in 2011. This year he was one of the first speakers opening up CPAC 2013, held in National Harbor, Md. As for his political future he said he is “probably not” going to make a run for his former South Florida in 2014 because “there are a lot of things I want to do,” but he kept the door open for 2016. We need Allen West to run against Senator Lamar Alexander in 2014. 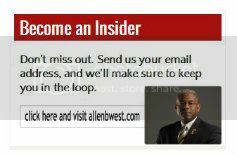 Allen West, you have my vote in 2014. We, the people who loves this country, need you. God bless you and your family. Allen we love you and pray for your strength to fight the good fight and be faithful to our God given principles. May God bless you, may His light shine upon and andmay He grant you His peace. Many heavenly awaits you sir. I am not a big fan of Oreilly, after his talking points…but he hit the nail on the head, that you should be the spokesman for the Tea Party, which IMO includes so many who do not even carry that label. It’s a heart thing!